Artaic’s latest designs examine the concept of reuse through patterns and textures of discarded material created in 100% recycled glass tile. The unique series, which presents stylized motifs of scrap paper, peeling paint, torn cardboard, dismantled pallets, and reclaimed wood, draws inspiration from the tile material itself – produced entirely from waste glass. Artaic’s location in Boston’s Marine Industrial Park, now revitalized as the Innovation District, provided extensive inspiration and materials for the design team, lead by Creative Director Paul V. Reiss. “As urban areas like this one reinvent themselves, it’s important to sort through the layered history, salvage pieces of the past, and integrate them with the new in a meaningful way. There is a lot of value in those pieces. They just need to be reframed.” The mosaic designs in ReSalvage were produced from material found around the Artaic studio. Shipping pallets and scrap pieces of lumber were piled on top of each other. Cardboard boxes were torn apart and the surface peeled away to reveal the corrugated pattern underneath. Newspapers were stacked and configured. Old paint was peeled away to produce interesting forms. 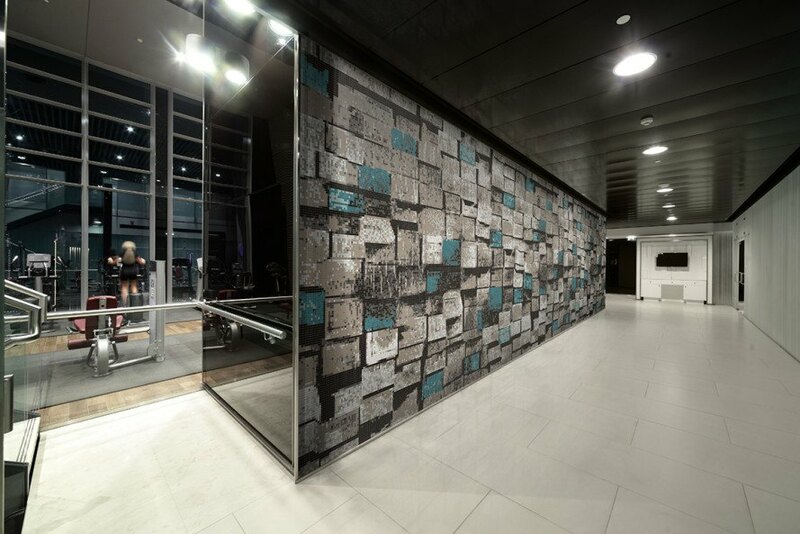 The physical compositions were then photographed, digitally manipulated, and transformed into tile patterns using Tessera™, Artaic’s mosaic design software. The ReSalvage mosaics are comprised of sintered glass tile made from 70% pre-consumer and 30% post-consumer recycled glass content, primarily from pulverized old windowpanes. Oxides are added to the glass powder to create a broad range of vibrant, saturated colors. Artaic’s sintered glass tile is produced by stamping the powdered glass into individually pressed tile shapes. The small formed pieces are then conveyed through a kiln and emerge after fusing and annealing as the strongest, most durable glass tile on the market. Artaic offers the sintered glass in ½” and 1” sizes and three finishes: standard glossy, slip-resistant matte, and opalescent. 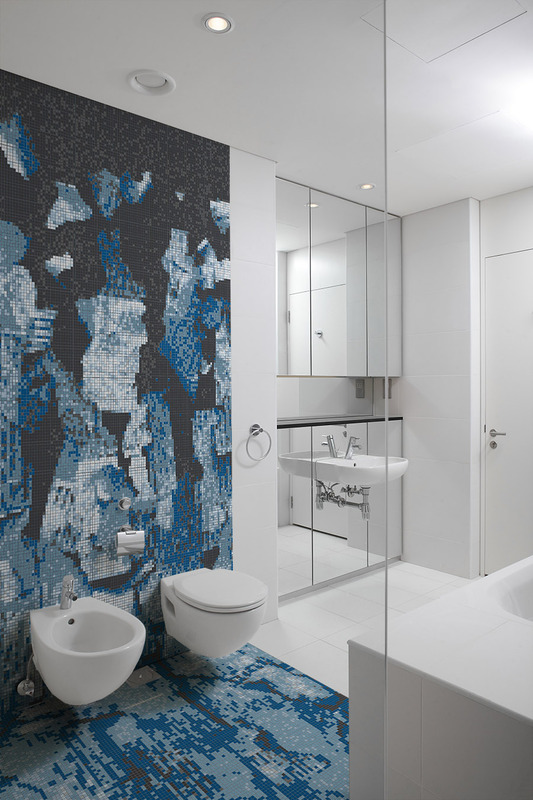 The mosaic designs in ReSalvage were produced from material found around the Artaic studio. The physical compositions were then photographed, digitally manipulated, and transformed into tile patterns using Tessera™, Artaic’s mosaic design software. The ReSalvage mosaics are comprised of sintered glass tile made from 70% pre-consumer and 30% post-consumer recycled glass content, primarily from pulverized old windowpanes. Artaic’s sintered glass tile is produced by stamping the powdered glass into individually pressed tile shapes. The small formed pieces are then conveyed through a kiln and emerge after fusing and annealing as the strongest, most durable glass tile on the market. Artaic offers the sintered glass in ½” and 1” sizes and three finishes: standard glossy, slip-resistant matte, and opalescent.